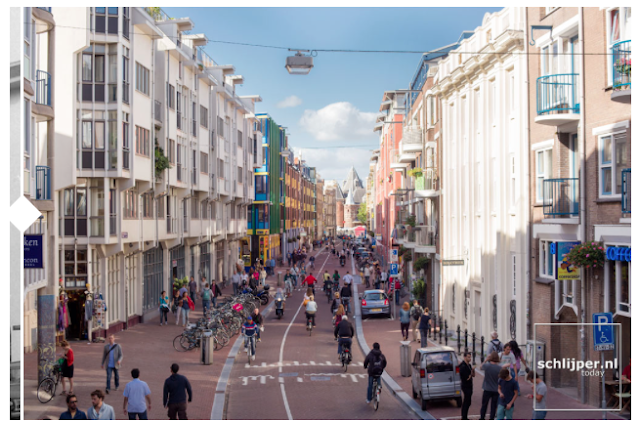 It’s a common argument when a city wants to take away space for cars: “This isn’t Amsterdam.” But guess what, Amsterdam—where half the traffic movement in the city center is by bike—wasn’t always Amsterdam, either. The image above serves as proof that better street design can improve daily life, not just for people on bikes, but for all residents. Once upon a time, Amsterdam was just like every other city in the middle of the 20th century: planning for cars, paving parking lots, and proposing urban freeways. Then the oil crisis of the 1970s happened. To help its citizens save gas, the Netherlands implemented a nationwide “Car-Free Sunday” in November of 1973. For one day each week, the country’s three million cars were not allowed on roads, leading to some interesting photos of horses and bikes on the country’s highways. Like similar car-free days in other countries, seeing the positive impact from this weekly activity inspired residents to bring about permanent change.